The Allerdale Ramble is nominally a 87km / 54 mile long distance path (LDP) starting in the Lake District National Park before striking out west for the Solway Firth coast. We say "nominally" as the key word here is "ramble": the walk designer, Harry Appleyard, gives you options at various points, the most significant being whether or not you scale Skiddaw. And even there if you do choose to climb that mighty hill he suggests several different routes you could use all of which fall within the Ramble. However the essence of this walk is that it starts at Seathwaite south of Derwent Water at the bottom of Borrowdale and it takes you back up Borrowdale and along the west side of Derwent Water to Keswick. Here you get to choose whether or not to climb Skiddaw but either way all options end up with you walking along the north east side of Bassenthwaite Lake and then on towards Cockermouth. Again there's another decision to be made here as the primary route skips Cockermouth by staying on the north side of the River Derwent but a diversion through Cockermouth may make a lot of sense. Both paths are re-united for the next leg heading west towards Maryport and the coast only to split 3km out with the primary route going to Maryport and the alternative direct to open shoreline. From there the path joins the Cumbria Coastal Way for the final sections up the coast to Grune Point. It is indeed a ramble and it's probably different for everyone who walks it! 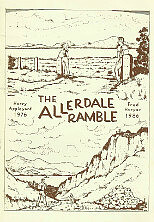 The Allerdale Ramble was originally devised and published in a sixteen page booklet by Harry Appleyard in 1976. In 1986 Fred Harper wrote a forty page guide to the Ramble which was published by Allerdale District Council1 and available for free from the Countryside Commission2 and from libraries, tourist information, etc. It's long out of print but copies do crop up on Amazon sometimes, which is where we got our copy - shown on the left. It's rather lovely (although now far too nice to want to stuff in a rucksack). In 1997 Jim Watson wrote The Cumbria Way and the Allerdale Ramble: a Walking Guide published by the always excellent Cicerone so for practical purposes this is probably the book to buy if you want a printed guide. In 2010 Cumbria County Council decided to no longer support the Allerdale Ramble so it is no longer waymarked or recognised by Ordnance Survey as an LDP and hence is now longer marked on the appropriate maps but it uses public rights of way throughout so is still a good walk so long as you can read a map and follow instructions. We've described it here in the same six sections set out by Fred Harper. It will be clear as you read them that these are probably not sensible sections to use to tackle the walk as they're generally fairly short and start and end in unhelpful locations unless you have a support vehicle. The way marked on the map in each section is for what Fred Harper described as the primary route. But this is what's so nice about the Ramble: you make your own walk out of it. Unlike the Cumbria Way this is not a route with lots of people offering assistance with everything up to and including carrying your luggage and finding accommodation, however if you prefer to plan your own holiday then we can recommend the WalkLakes roomfinder to help you find the accommodation you need anywhere in the Lake District. Now part of Natural England.